We were all taught that since we were little kids. It does seem like water can conduct electricity and that is why we shouldn’t touch any electrical outlet or switches if our hands are not dry. Does water really conduct electricity? Let’s find out by doing a simple controlled experiment. small LED light (you can buy this or get it from an old Christmas string light decoration. Fill the small container with tap water. Using the electrical wires, connect the LED light and batteries to build an open simple circuit (a circuit with an open end). Dip the two open ends into the water. 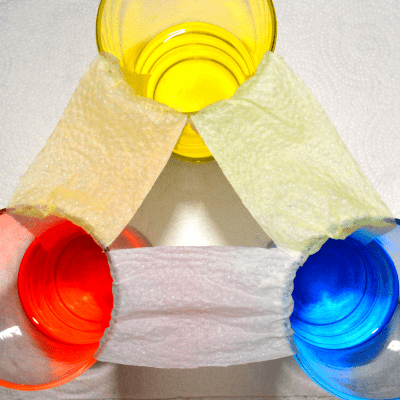 Now, repeat the experiment using the exact same setup, but this time, instead of using tap water, use distilled water. 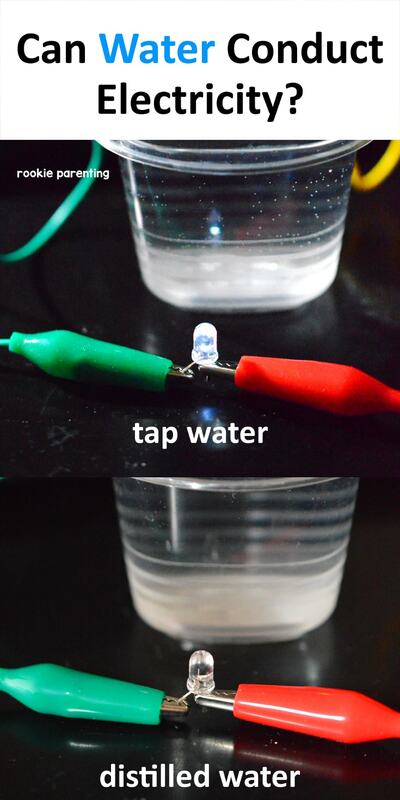 Using tap water, you should be able to complete the circuit and the LED bulb lights up. 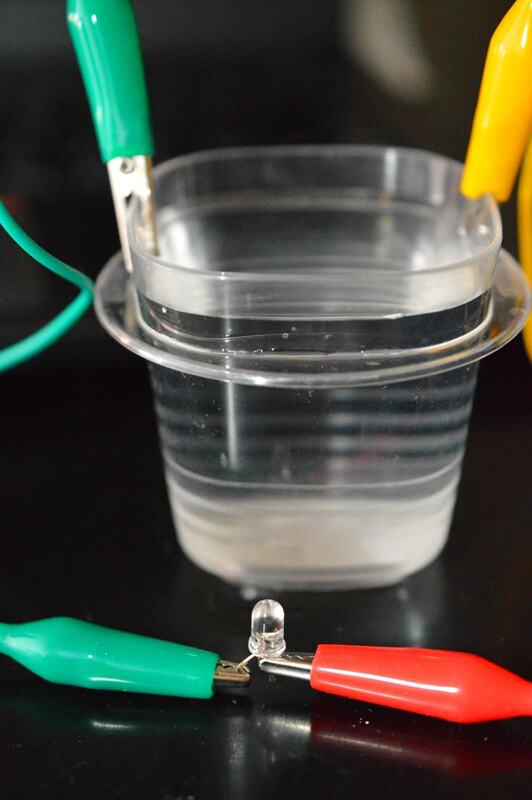 Using distilled water, however, does not complete the circuit and the LED bulb should not light up. However, if yours does, that means the “distilled water” used is not pure enough. Try a different brand of bottle distilled water or make your own. A controlled experiment is a test done twice with exactly the same conditions and variables except for one. That one varied element is called an experimental control. In this exercise, water is the experimental control. Everything else in the experiment remain the same. So we can conclude that the difference in the outcome is caused by the control, i.e. the water. So tap water can conduct electricity while distilled water cannot. An electric current is conducted by a flow of electrical charges such as electrons or ions. Pure water contains very few ions and so it is a poor electricity conductor. But when impurities such as salt dissolve in water, the resulting solution conducts electricity very well. Tap water is such a solution. Most water we come into contact with, such as tap water or not completely distilled bottle water, contain impurities that turn water into a conductor. That is why you MUST NOT touch electrical outlets or switches with wet hands. But not all impurities can do so, only those that can contribute ions, such as salt. 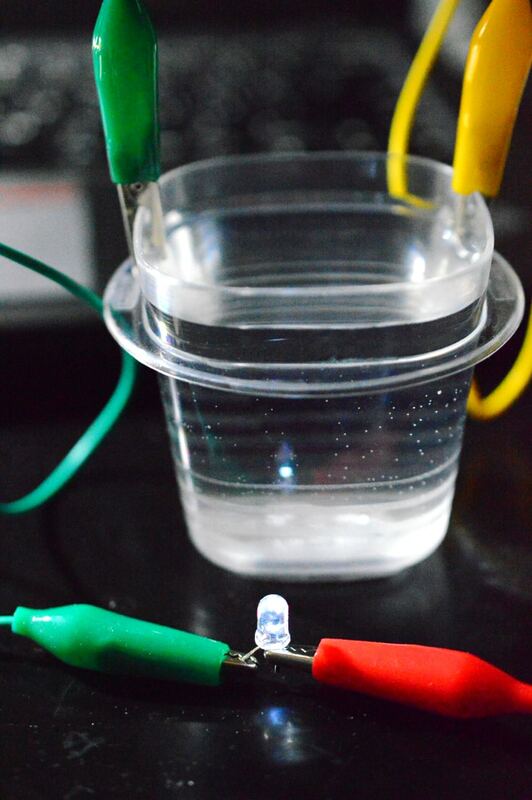 Do the experiment again by adding salt into the pure water and see if the LED bulb lights up. The LED bulb may even be brighter than the one using tap water because salt water conduct electricity better than tap water does. Do the experiment again by adding sugar into pure water. 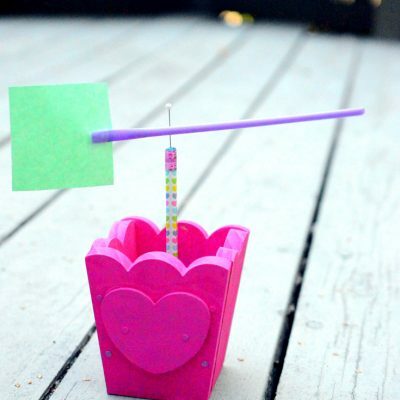 This time, the LED bulb does not light up because sugar cannot contribute ions to the solution.